Each frame is .1 seconds apart. Inge de Bruijn's time for this event was 24.58. This analysis is presented for comparison purposes. 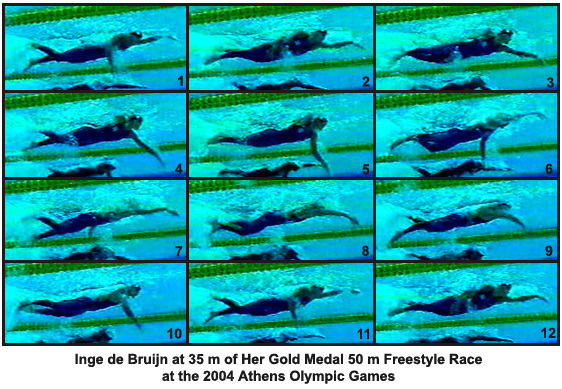 As has been reported elsewhere, in 2004 Inge de Bruijn performed with a straight arm recovery stroke. This analysis presents the same stroke phase in 2000 and 2004 so that any differences in the strokes could be discovered. 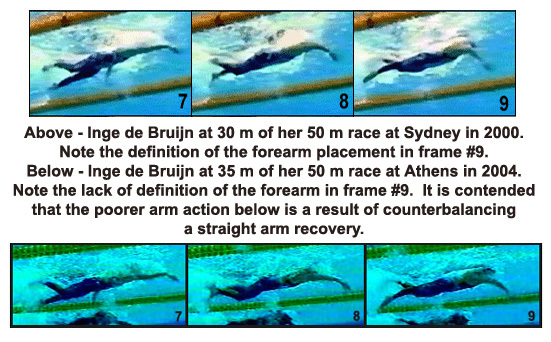 It is contended that the reposition phase of the stroke, as is evidenced in 2000, is not as good in 2004. It is hypothesized that the difference is due to the straight arm recovery stroke. A picture of the two stroke phases is provided below. The following is each frame in detail in a sequential collage.